High power. Low recoil. The ultimate self defense pistol. The Vector SDP is the Non-NFA semi-automatic pistol variant of the Vector platform. It features a short, threaded, 5.5” barrel. A rear quick detach sling point assists with carrying the firearm. Additional standard equipment on the KRISS Vector SDP are the Magpul MBUS sights, full-length Picatinny top rail and a Glock Magazine. Although this SDP maybe small, it still has the same capabilities as its larger counterpart, and is civilian legal in most states. 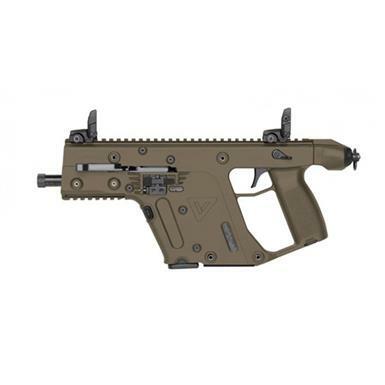 Kriss Vector Gen II SDP FDE Pistol, Semi-Automatic, .45 ACP, 5.5 Barrel, 13+1 Rounds is rated 5.0 out of 5 by 2. Rated 5 out of 5 by Beck from A novelty, but fantastic. I bought a Gen2 here on SG. I hadn't used it with one of my Aimpoints, so I ran the MBUS at the range. I could hit a coke can 3x, at 40-50Y, inside 5 seconds with the included MBUS sights. So it is more accurate in 45 than I am with my SP5K in 9mm. Rated 5 out of 5 by jimbob from Very cool. Low recoil an dkick I've had my Vector for two plus years and use it in training I do. More of a fun firearm to shoot than practical for most shooters. Sights are no good, but I use laser on mine and its awesome out to 15-20 yards. I typically shoot this from the hip. Simple to breakdown and clean as well. Very cool design to make this have low recoil and rise.